The Anaheim Convention Center's website listed Blizzcon as occurring on October 22nd and 23rd, but then the listing was promptly taken down. First, the celebration of all things Blizzard in 2010 was going to be in Las Vegas. Then it wasn't. 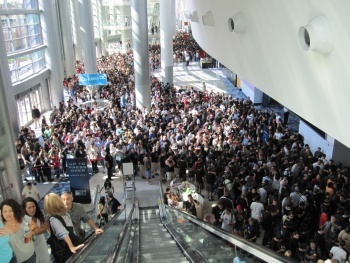 Now, it appears as if Blizzcon 2010 is going to be in Anaheim after all. In what is now a completely expected scenario, the Anaheim Convention Center removed the listing and there is no official word from Blizzard on where or when (or even if) Blizzcon 2010 will be occurring. Still, all signs point to Anaheim on October 22nd. A representatice from the Convention Center told Wow.com that the listing was "99.9% confirmed" despite it being taken down. Now, on to more important matters, such as speculation into what Blizzard will be announcing at the convention. It's certainly a big year for Blizzard with Cataclysm and Starcraft II getting ready to drop and Diablo 3 on the horizon, but the company usually only holds a convention when it has something big to talk about. In '05, '07 and '09, it was a new expansion for Wow, with the only major announcement from '08 being the Wizard class in Diablo 3. If the every other year rule follows, we probably won't hear about a new expansion in 2010. Will Blizzard finally unveil double secret "next gen MMOG" that it has been keeping under wraps? Will we learn that Wow is going all micro-transactiony with the the Pandaren as the first pay-to-play race? Will Jay Mohr be the host again or are they going to hire someone who is actually funny?